National Dog Day is on August 26! 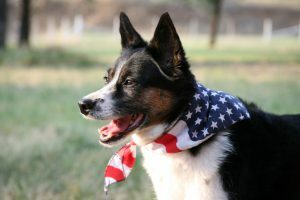 Founded in 2004 by Colleen Paige, a Pet & Family Lifestyle Expert and Animal Advocate, National Dog Day was created to bring attention to dogs, both mixed breed and purebred, and encourage adoption. Are you ready to celebrate this special day with your four-legged best friend? Here are some ideas to get the festivities started. Adopt a dog – Want to commemorate National Dog Day but don’t actually have a dog? Has adopting a dog been on your mind for a while? Well there’s no better day than National Dog Day to put your plans in action‒as long as if you have thought it through and understand the time and financial commitment involved in caring for a pet for its entire lifetime. The American Kennel Club has a quiz you can take to see if you are ready to get a dog. Donate to an animal shelter – Help homeless dogs and other animals by donating to an animal shelter. Shelters often need towels, blankets, food, toys, grooming tools and other items. Shelters may also be short on office and cleaning supplies. Check with your local shelter to see what things they have on their wish list. Volunteer at an animal shelter or rescue – In addition to donating things, you can also donate your time. Many shelters welcome volunteers who can help walk dogs, clean cages, or do other work around the facility. Consider donating different types of services as well. If you are a photographer, you can offer to take pictures of the animals so they can be posted on social media to help them get adopted. A graphic designer might be able to assist with a shelter or rescue organization’s website or design flyers for fundraising events. If you are handy with tools you could provide help with building or repairs. Have a puppy party – Invite dogs (and their humans) to a dog-friendly park or your fenced-in backyard for a National Dog Day party! Make sure your canine guests are well-socialized and not the type that would start fights with other dogs. You want the party to be fun, not stressful. Decorate the area with some balloons and bring doggie treats and some toys (enough for all the dogs so there’s no fighting). Want to go all out? Make a cake for the dogs! Check out this cake for dogs recipe. As for the human guests? Serve them dog-themed goodies like these cute puppy cupcakes. Pamper your pet – Today your dog is the center of the attention. Spoil your pooch with extra treats, a new toy or bed, or an extra-long trip to his favorite walking or playing spot. You can even indulge your dog with a canine massage. Canine massage practitioners are certified professionals who have been trained on canine anatomy, physiology and behavior. And canine massage is more than just a luxury; it is said to have health benefits including promoting relaxation, pain relief and improved joint flexibility. Learn more about canine massage and find a practitioner here. Share your love for your dog – What’s a special occasion without posting about it on social media? Take pictures of your dog and share them on your social channels with the hashtag #NationalDogDay. Commission an artist to paint or draw a pet portrait – If you have an especially beautiful photo of your pet, consider commissioning a professional artist to paint or draw a portrait of it. There are many talented artists who paint beautiful portraits of pets for anyone who wants a truly one-of-a-kind piece of artwork as a way to honor their special furry family member. For lots of other ideas, visit NationalDogDay.com. Happy National Dog Day!